Copyright © 2015 by Rosanna L. Hamilton. All rights reserved. James W. Christy, a U.S. Naval Observatory scientist, was studying plates to refine our knowledge of Pluto's orbit and position, when the discovery of Charon was made. The discovery image of Charon and Pluto was taken on July 2, 1978. The new satellite was named after the ferryman who rowed souls across the River Styx to Pluto's realm in the underworld of Greek and Roman mythology. Charon is informally pronounced "SHAR-on," similar to the name of the discoverer's wife, Charlene. The 1978 discovery of Pluto's satellite, Charon, was a breakthrough in gaining understanding of Pluto. By measuring the distance between the two and knowing the orbital period, it was possible to calculate for their mass. Charon's mass is about 9.6 x 10-10 solar masses. This is about 1/7th the mass of Pluto. During the 1980's, Earth crossed the orbital plane of Charon and a series of mutual events were observed that significantly enhanced the study of the Pluto-Charon system. It was fortunate that Charon's discovery was made prior to the mutual events, considering that the sun crosses the orbital plane of Charon only twice during a single Plutonian year. The mutual events led to the first accurate determination of the sizes of Pluto and Charon. 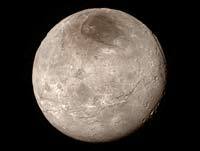 Charon's diameter is 1,172 kilometers (728 miles), just over half the size of Pluto. Charon is the largest satellite relative to its planet in the solar system. Their average separation is 19,640 km (12,200 miles). Charon's orbit is gravitationally locked with Pluto, so both bodies continually keep the same hemisphere facing each other. Pluto and Charon's rotational periods, and Charon's orbital period are 6.387 days (6 days, 9 hours, 17 minutes). Charon's surface composition is different from Pluto's. The moon appears to be covered with water-ice rather than nitrogen ice. Charon's density is 1.2 to 1.3 g/cm3, indicating it contains little rock. Pluto's density is 1.8 to 2.1 g/cm3. The differences in density tell us that Pluto and Charon formed independently. This rules out the idea that they accreted together as a double planet. The accuracy of Charon's density provided by the HST information is still being challenged by observers from ground based telescopes. Some theorize that Charon was formed when a planetesimal slammed into Pluto long ago, similar to the idea considered as the origin event of Earth's moon. "Pluto's axis or rotation and Charon's orbit are highly inclined, as we might expect from such an impact." It is thought possible that Charon, Neptunes' moon Triton, and Pluto are icy worlds of the outer solar system that were not swept up by Uranus and Neptune or ejected from the solar system. These three appear to be relatives. Charon and Triton could have become satellites and the largest could have become Pluto. Although there is yet much to be learned, observation of mutual events and other studies provided new data that has greatly enhanced our understanding of Charon, Pluto, and the outer solar system. Remarkable new details of Pluto's largest moon Charon are revealed in this image from New Horizons' Long Range Reconnaissance Imager (LORRI), taken late on July 13, 2015 from a distance of 289,000 miles (466,000 kilometers). A swath of cliffs and troughs stretches about 600 miles (1,000 kilometers) from left to right, suggesting widespread fracturing of Charon's crust, likely a result of internal processes. At upper right, along the moon's curving edge, is a canyon estimated to be 4 to 6 miles (7 to 9 kilometers) deep. Mission scientists are surprised by the apparent lack of craters on Charon. South of the moon's equator, at the bottom of this image, terrain is lit by the slanting rays of the sun, creating shadows that make it easier to distinguish topography. Even here, however, relatively few craters are visible, indicating a relatively young surface that has been reshaped by geologic activity. In Charon's north polar region, a dark marking prominent in New Horizons' approach images is now seen to have a diffuse boundary, suggesting it is a thin deposit of dark material. Underlying it is a distinct, sharply bounded, angular feature; higher resolution images still to come are expected to shed more light on this enigmatic region. The image has been compressed to reduce its file size for transmission to Earth. In high-contrast areas of the image, features as small as 3 miles (5 kilometers) across can be seen. Some lower-contrast detail is obscured by the compression of the image, which may make some areas appear smoother than they really are. The uncompressed version still resides in New Horizons' computer memory and is scheduled to be transmitted at a later date. The image has been combined with color information obtained by New Horizons' Ralph instrument on July 13. This image of an area on Pluto's largest moon Charon has a captivating feature -- a depression with a peak in the middle, shown here in the upper left corner of the inset. The image shows an area approximately 240 miles (390 kilometers) from top to bottom, including few visible craters. This image gives a preview of what the surface of this large moon will look like in future close-ups from NASA's New Horizons spacecraft. This image is heavily compressed; sharper versions are anticipated when the full-fidelity data from New Horizons' Long Range Reconnaissance Imager (LORRI) are returned to Earth. The rectangle superimposed on the global view of Charon shows the approximate location of this close-up view. Views of the Solar System Copyright © 1995-2015 by Calvin J. Hamilton. All rights reserved. Privacy Statement.